10. Patient are getting their medical marijuana cards faster than ever in as little as 3 weeks from seeing a medical marijuana physician for their initial consult to receiving their actual card. 9. Medical Cannabis is available in several varieties including high potency cannabidiol (CBD) oil and high THC sublinguals as well as capsules and vapes. 8. Medical marijuana products sold at state licensed dispensaries are pesticide free unlike illegal street marijuana, which may contain a wide range of harmful chemicals. 7. Almost all state wide dispensaries offer incredible discounts on medical marijuana, with some offering up to 20% off on all lifetime purchases! 6. Dispensary staff are knowledgeable and educated in all products and have answers to all your medical marijuana questions. 5. Licensed state dispensaries are obliged to follow Florida state law which ensures the highest standards of consumer safety and confidentiality. 4. Get your medical cannabis delivered to your doorstep! You don’t even have to leave the house. 3. Many dispensaries sell pre filled vape pens which means that you don’t need to spend money on a vape (which can be quite expensive). 2. Dispensary product is cultivated according to the highest standards in cultivation in the state of Florida! 1. Medical cannabis is cultivated specifically for your health condition. 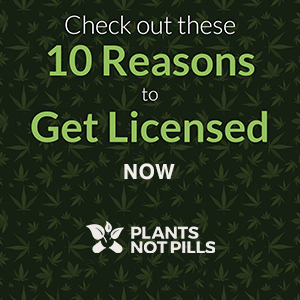 For more information on getting a medical marijuana card and accessing medical marijuana strains that could help treat your symptoms, contact hello@plantsnotpillsusa.com or call us directly at (813) 603-3107.